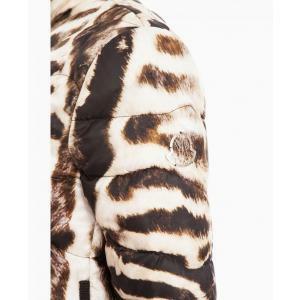 Ivory 'Joinville' padded coat from Moncler featuring a funnel neck, an off-centre front zip fastening, long sleeves, side zipped pockets, a quilted effect and a straight hem. I love this coat. Yes, it's pricey but Moncler is worth the investment. The coat looks amazing on...like a fit and flare dress. It is warm without added bulk and very flattering on. I purchased this coat because it works well for both work and casual (so I saved money buying one coat, instead of two right?). I am 5'5 with a 36DD chest and weigh about 135 lbs. I was worried about the sizing and am happy that I went with the size 2. Perfect fit! This is a definite must have!